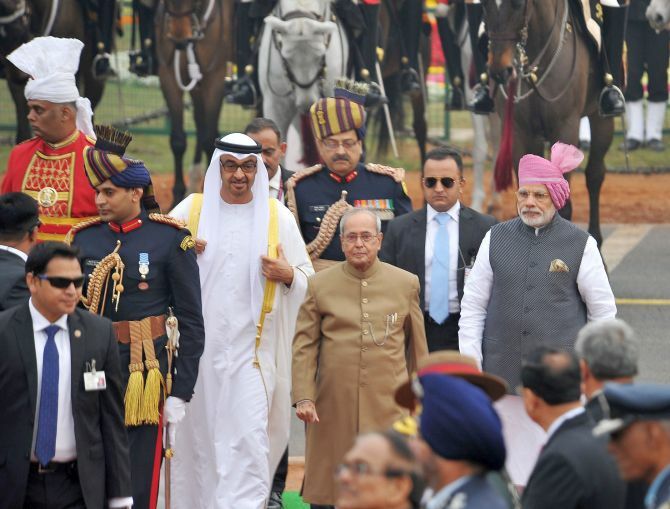 The majestic Rajpath saw a scintillating display of India's military might and resplendent cultural diversity as the country celebrated its 68th Republic Day on Thursday, with the Crown Prince of Abu Dhabi Sheikh Mohamed bin Zayed Al Nahyan attending the event as guest of honour. 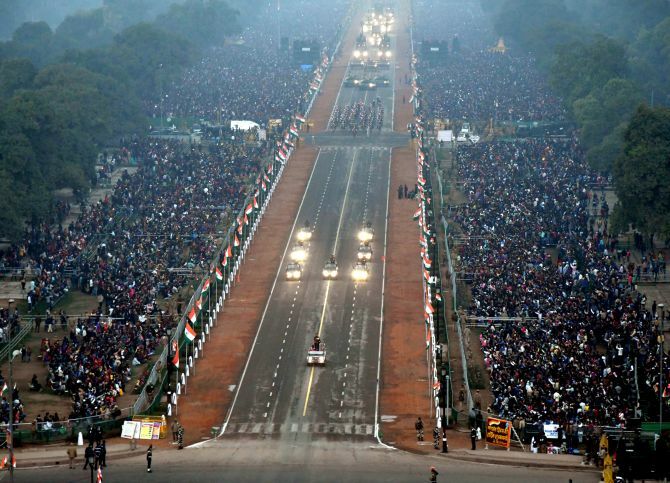 Light rain and overcast skies failed to dampen the enthusiasm of thousands of spectators who watched the nearly an hour-and-half-long parade along the imposing Rajpath, India's ceremonial boulevard. 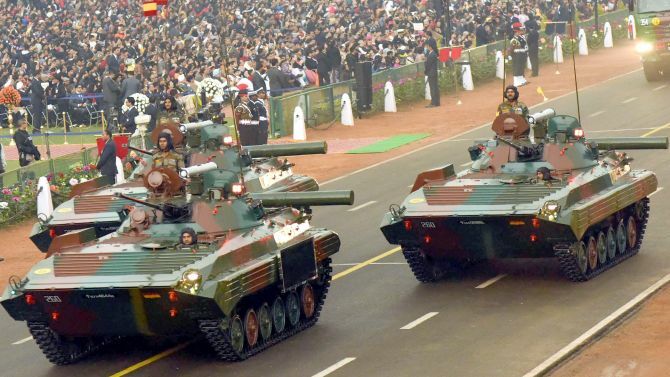 A major highlight of the parade was 149-member marching contingent from the United Arab Emirates comprising personnel from Presidential Guards, the Air Force, the Navy and Army, led by a band comprising 35 musicians from the Gulf country with which India's defence and security ties are on an upswing. 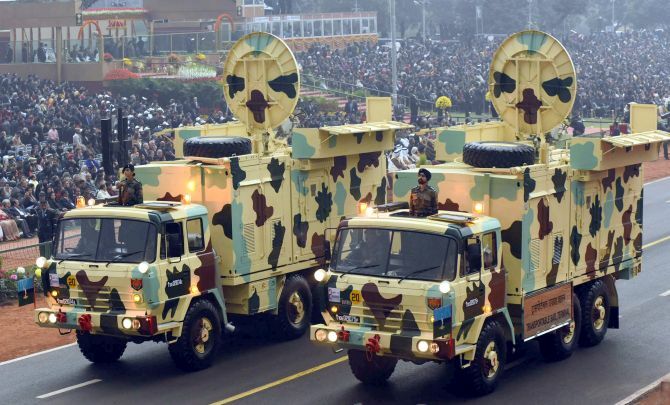 In a first, the 'black cat' commandos of the elite counter-terror force National Security Guard participated in the parade which drew loud cheers from the spectators. 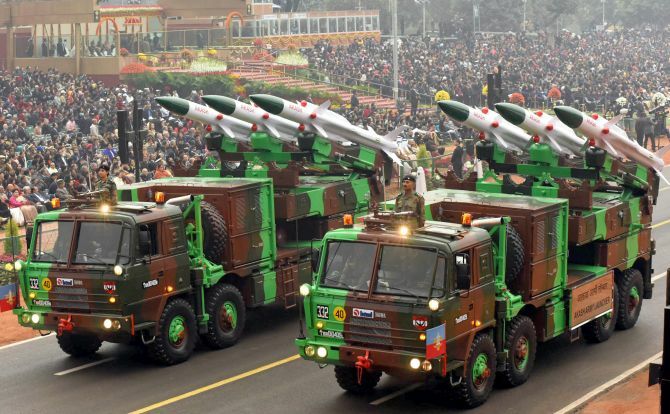 A number of weapons systems and aircraft including the Tejas light combat jets and the Airborne Early Warning and Control System developed by the DRDO were on display, showcasing India's military prowess. 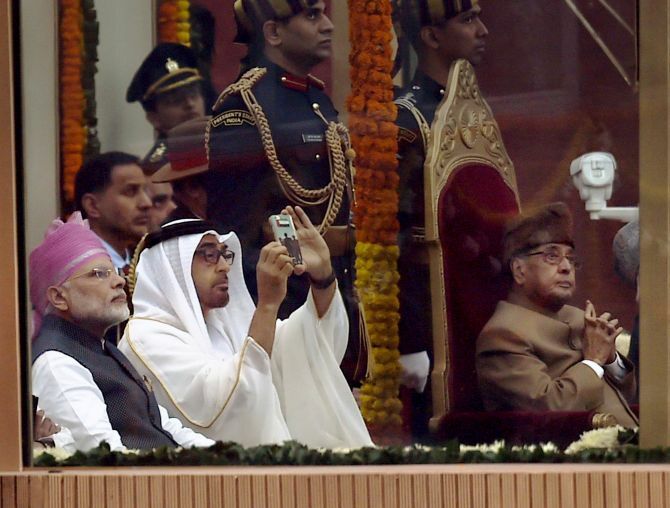 Al Nahyan, also Deputy Supreme Commander of the UAE armed forces, was seated next to Prime Minister Narendra Modi who wore a pink coloured 'safa' (turban). The two leaders were seen sharing some light moments. 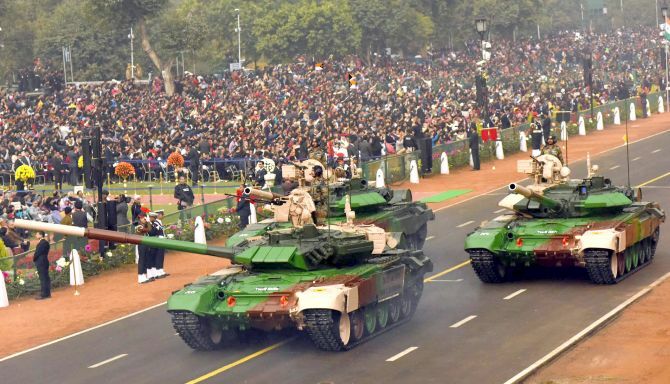 The Indian Army's missile firing T-90 'Bhishma' tank, Infantry Combat Vehicle BMP-2K, Mobile Autonomous Launcher of the BrahMos Missile System, Weapon Locating Radar 'Swathi' and Akash Weapons System, and Dhanush artillery guns were among the main draw in the mechanised columns. President Pranab Mukherjee took the salute of marching contingents. 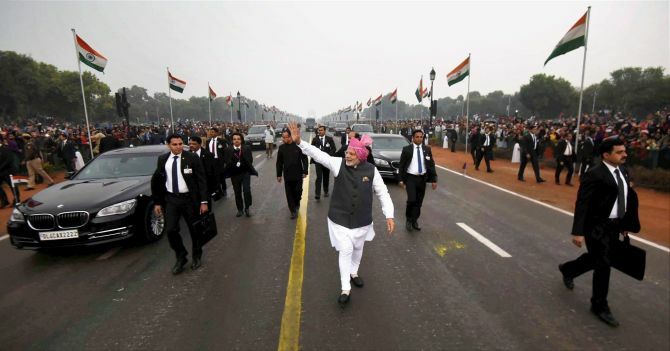 Alongside the Crown Prince, the ceremonial parade was watched by Vice President Hamid Ansari, former Prime Minister Manmohan Singh, Congress chief Sonia Gandhi and the country's top political and military brass, besides the diplomatic community. Tableaux from 17 states and Union Territories and six central ministries and departments showcased the varied historical, artistic and cultural heritage of the country. Interestingly, Goods and Services Tax was the theme of the tableau of Central Board of Excise and Customs. Twenty one of the 25 children who won the National Bravery Award also participated in the parade. Four children have received the award posthumously. The grand finale of the parade was a spectacular flypast by the Indian Air Force which displayed various formations like 'Chakra' and 'Vic' leaving spectators spell-bound. 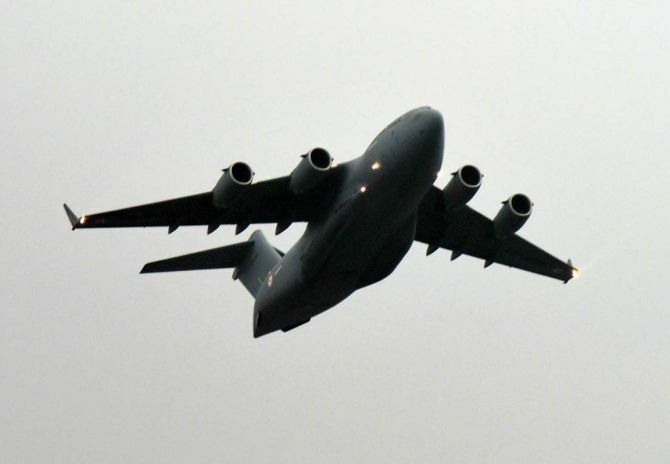 The 'Hercules' formation comprising three C-130J Super Hercules aircraft also drew loud cheers. A massive ground-to-air security apparatus was put in place in the national capital turning the city into a virtually impregnable fortress. Snipers of the National Security Guard were deployed atop all high-rises along the parade route. 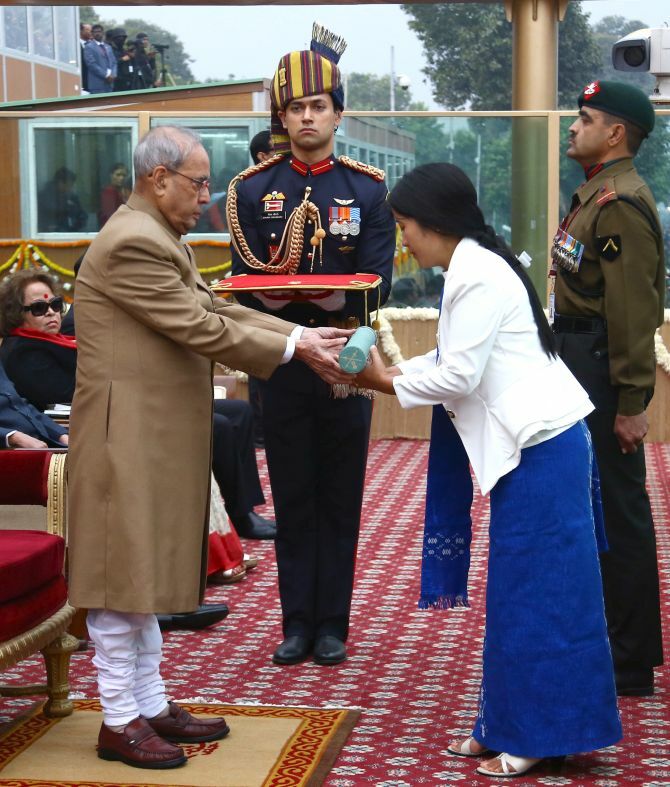 President Mukherjee also gave away the Ashoka Chakra, India's highest peacetime gallantry award, to Hangpan Dada of Rashtrita Rifles posthumously. The theme of IAF tableau was "Air Dominance Through Network Centric Operations" and it displayed the scaled down models of Su-30 MKI, Mirage-2000, AWACS, UAV, Apache and Communication Satellite. The Indian Navy's tableau showcased the lethal Marine Commandos proceeding for action, the indigenously built Kolkata Class Destroyer and the Kalvari Class next generation attack submarines. It also showcased a model of the P-8I Long Range Maritime Patrol Aircraft. 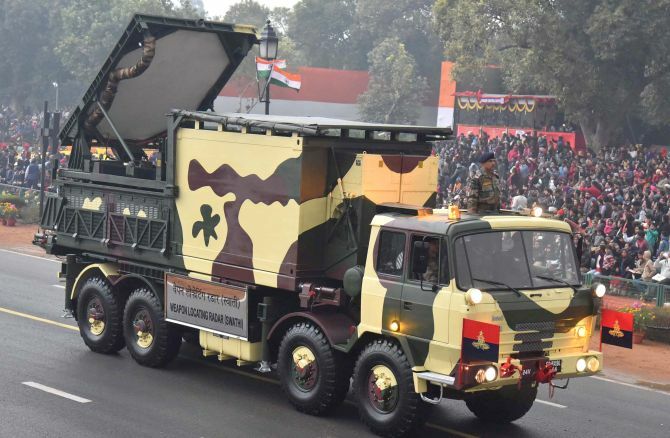 The parade was commanded by Lt General Manoj Mukund Naravane, General Officer Commanding, Delhi Area. 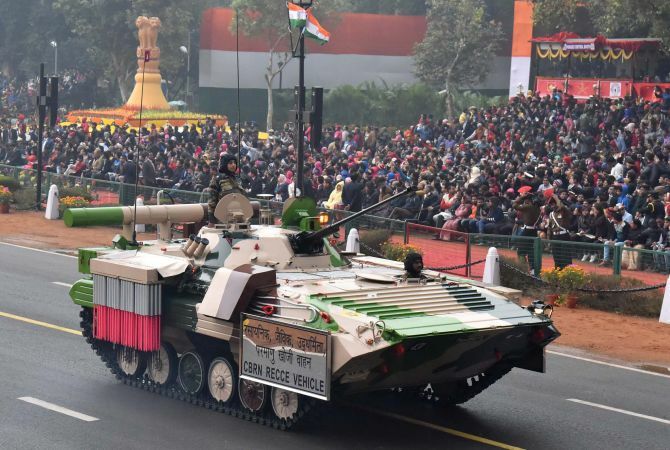 The marching contingents of Army included horse-mounted columns of the 61st Cavalry, the Mechanised Infantry Regiment, the Bihar Regiment, the 39 Gorkha Training Centre, 58 Gorkha Training Centre, the Madras Engineering Group and Centre and 103 Infantry Battalion. 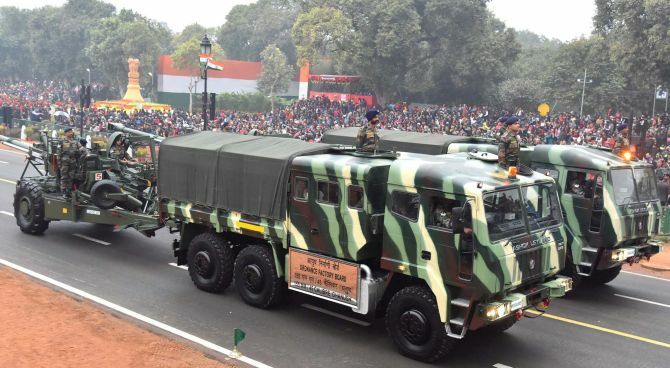 The paramilitary and other auxiliary civil forces included the Border Security Force's Camel Contingent, Indian Coast Guard, Central Reserve Police Force, Central Industrial Security Force, Delhi Police, National Cadet Corps and National Service Scheme. The Navy contingent comprised 144 young sailors and was led by Lieutenant Aparna Nair. Tableaux from states, Union Territories and Union ministries presented the historical, artistic and cultural heritage of the country. 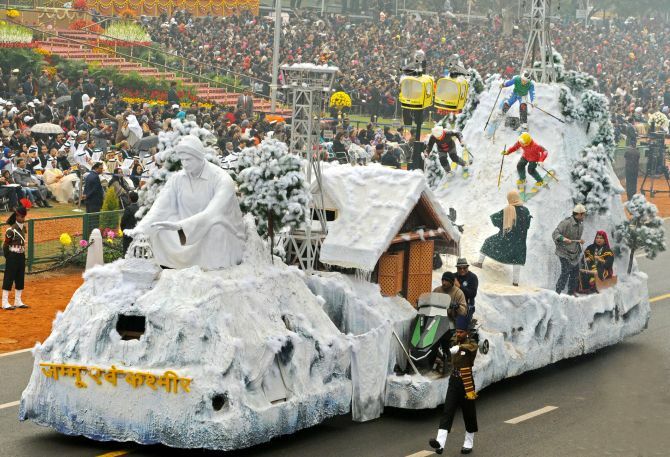 Floats from Goa, Gujarat, Odisha, West Bengal, Assam and Jammu and Kashmir showcased the country's progress in different fields. In the children's pageant section, about 600 boys and girls drawn from three schools in Delhi and a group of school children from South Central Zone Cultural Centre, Nagpur, performed colourful dances on varied themes. 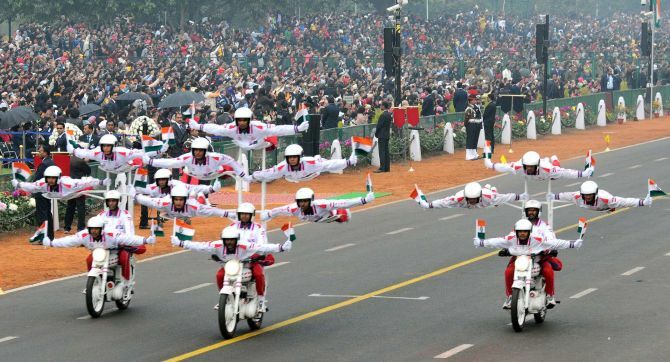 The splendid driving skills of 'Dare Devils'--the motorcycle acrobatics team of Corps of Military Police was a major attraction of the parade. 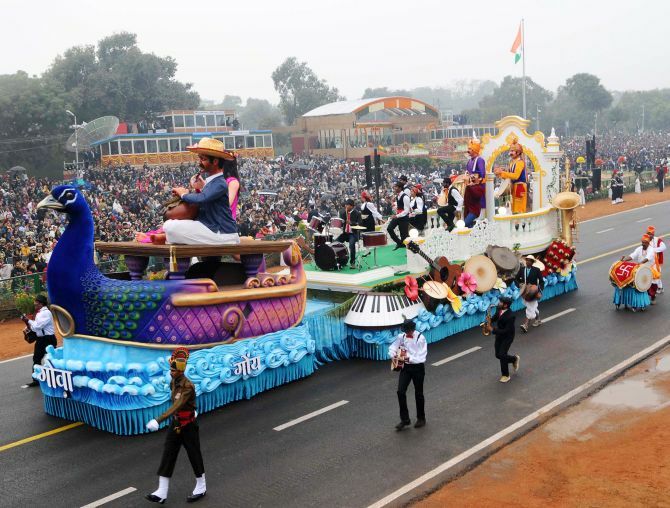 They performed breathtaking manoeuvres like Salute to President, Ladder, Double Bar, Lotus, Christmas Tree, Aircraft, Sudarshan Chakra, Flower Pot, Pyramid and Wheeling on moving motorcycles. The 'Netra', an Airborne Early Warning and Control System aircraft also known as "Eye in the Sky" was one of the major attractions. It was followed by the 'Globe Formation' comprising one C-17 Globemaster flanked by two Su-30 MKIs. Next in line were the fighters, with five Jaguars fling in arrowhead formation, while five MiG-29 fighters darted through the sky in fulcrum style. 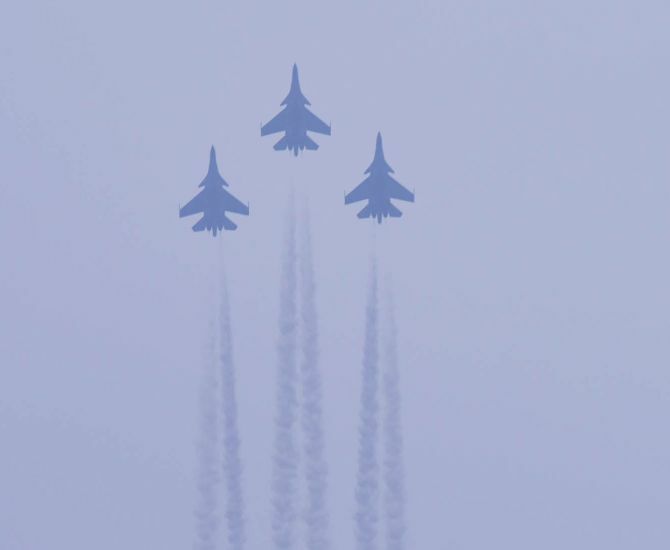 It was followed by the breathtaking 'Trishul' formation comprising three Su-30 MKIs. The flypast concluded with another Su-30 MKI carrying out a 'Vertical Charlie' manoeuvre over the saluting dais. The ceremony concluded with the national anthem and release of colourful balloons. Minutes before the parade began, the prime minister, Defence Minister Manohar Parrikar and chiefs of army, navy and air force laid wreaths at 'Amar Jawan Jyoti', the war memorial at the India Gate where an eternal flame burns in the memory of those who laid down their lives defending the nation's frontiers. As part of the multi-layered security, around 60,000 security personnel were deployed across the city.